For the first time, the SuperKEKB collider at the KEK laboratory in Tsukuba, Japan, is smashing together particles at the heart of a giant detector called Belle II. The project looks for potential differences between matter and its mirror-world twin, antimatter, to figure out why our universe is dominated by just one of the pair. The experiment has been seven years in the making. During construction of the Belle II detector, the SuperKEKB accelerator was recommissioned to increase the number of particle collisions, a measure called its luminosity. Even now, the accelerator is preparing for the second part of this upgrade, which will take place in stages over the next 10 years. The upgrade will more tightly focus the beams and solidify SuperKEKB’s position as the highest-luminosity accelerator in the world. On March 21, SuperKEKB successfully stored an electron beam in the main ring, and on March 31 it stored a beam of positrons, the electron’s antimatter counterparts. With the two colliding beams in place, Belle II saw its first successful collisions today. Scientists predict that antimatter and matter should have been created in equal amounts during the hot early stages of the big bang that formed our universe. When matter and antimatter meet, they annihilate in a burst of energy. Yet despite their presumed equal ratio, matter has clearly won the fight, and now makes up everything we see around us. It is this confounding mystery that Belle II seeks to unravel. Belle II’s beauty lies in its ability to detect unimaginably minute debris from high-energy collisions between electrons and positrons—particles so small they aren’t made up of anything else. In this debris, scientists look for physics beyond what they currently know by comparing particles’ properties to their predictions. The detector is especially sensitive to how other fundamental particles called quarks decay. It can closely study both quark properties and the structure of hadrons: particles made of multiple quarks bound together tightly. At Belle II’s core, electrons and positrons collide at a high enough energy to create B-mesons, particles made of one matter and one antimatter quark. Scientists are particularly interested bottom quarks, also known as beauty quarks. Bottom quarks are produced along with charm quarks at the center of Belle II. Both are heftier cousins of up and down quarks, which make up all ordinary matter, including you and whatever device you’re using to read this article. The collisions also produce tau leptons, which are like massive electrons. All of these particles are seldom found in nature, and observing them can reveal new physics. Since B-mesons contain bottom quarks, which have diverse kinds of decays, scientists will use Belle II to observe the different meson decays. If a meson containing regular quarks decays differently than one containing their antimatter twins, this could help explain why the universe is full of matter. Belle II is the successor of earlier experiments used to produce B-mesons, Belle and BaBar. It will record about 40 times as many collisions as the original Belle. It’s also a tremendous collaboration between 25 countries, with 750 national and international physicists. 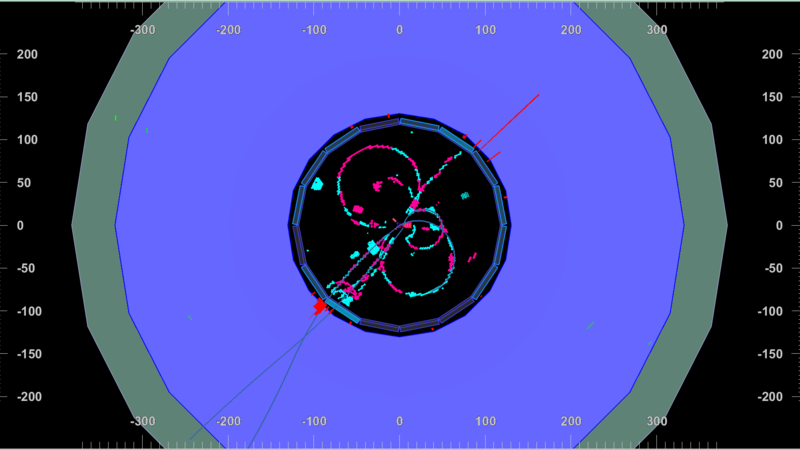 With more collisions at the center of Belle II, scientists have more opportunities for an uncommon or unheard-of decay event to take place, giving them better insight into quarks’ behavior and how it factors into the universe’s creation.